Our desire for Honeysuckle Biscuits and Bakery is to become part of your family and woven into the fabric of the community. Remembered for special occasions and moments, returned to for that great slice of cake or favorite biscuit and recommended to friends and family as the place to go feel loved and welcome. I grew up on Honeysuckle Court in Smyrna GA (great name for a bakery!) baking biscuits, cakes and cookies with my mother and grandmother. While I dreamed of owning my own business (bakery perhaps? ), practicality won out and after graduating from Berry College with an accounting degree, I spent the next 20 years climbing the corporate ladder and raising a family in West Cobb. However, I never lost the desire to own my own business. Fast forward to a few years ago, my husband Mitch and I had the crazy idea of starting our own bakery featuring my mom’s homemade biscuits in the heart of our community that would be a gathering place for families, college students, friends and neighbors. But our desire is to create something larger than us; something that will last beyond us. Be a light to the world; a city on a hill. Everyone has their burdens and baggage; we want to share God’s love and hopefully leave people feeling better and happier than before. That’s a big goal where great food is just the beginning. Create a unique environment where you can get a fantastic homemade biscuit as well as a tasty donut or pastry and come back all day to satisfy your sweet tooth with a vast selection of cakes, pies, cookies, ice cream and more! Bring high quality coffee to our city by partnering with a local Atlanta roaster, utilizing the best espresso machines and equipment, and hiring experienced baristas that live and breathe “the coffee life”! Be a warm inviting place in the heart of our community where everyone is welcome, loved, comfortable and desires to return! 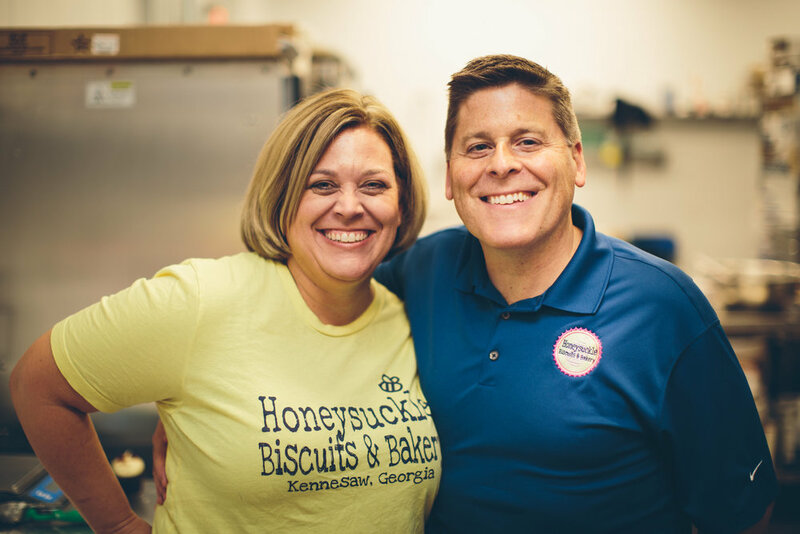 In June of 2018, Honeysuckle Biscuits and Bakery was born on Main Street in Kennesaw GA. It has been a labor of love and we are truly grateful for everyone’s support and encouragement. While we are constantly growing and evolving, we will always do our best to exceed your expectations and make you smile!